China is one of the world’s fastest-growing and important markets for devices running Android(s GOOG) and iOS(s AAPL). But it’s not alone on the international stage: almost a dozen countries have made enormous gains in activations of these devices in the past year outside of early-adopting Europe and North America. As of July 2012, there are now 640 million devices running Google and Apple’s mobile operating systems, according to Flurry Mobile’s report released Monday. The rate at which these smart mobile devices are being adopted worldwide is now far outpacing the adoption of any other technology. “Compared to recent technologies, smart device adoption is being adopted 10X faster than that of the 80s PC revolution, 2X faster than that of 90s Internet Boom and 3X faster than that of recent social network adoption,” Flurry writes. 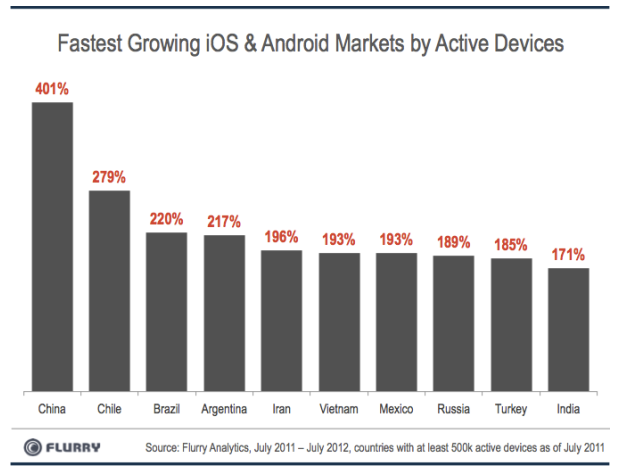 Flurry’s most recent report looked at and tracked the use of 200,000 Android and iOS apps all over the world. From the chart below, you can see that China is very clearly the fast-growing market for advertisers and developers who make apps. The adoption of Android and iOS devices together is up more than 400 percent in the country from July 2011 to July 2012. While these countries are making huge gains in activating mobile devices, only two on the list, China and Brazil, rank in the top 10 for countries with the most total Android and iOS devices in use. Those countries, are, in order: US, China, UK, South Korea, Japan, Germany, France, Canada, Spain and Brazil. The US has 165 million active devices, and Brazil 13 million. So the range of the top 10 is huge. But with Brazil, and of course, China’s growth rates, it’s pretty clear those companies are going to continue to move up in the rankings. The picture could look very different a year from now. It’s simply wrong to throw iOS in with Android’s Explosive Growth….. Erica! Android has been outpacing iOS 4 to 1 Globally. Which yes… on it’s face means the rest of the competition is being obliterated. But makes us smarter folks wonder why not put iOS at the back of the bus with the other systems losing to Android? Something that you fail to point out here, is that since Apple revealed their true sense of the Chinese as being 2nd class citizens as well as their own companies (Proview hint… hint), their sales are falling. No group of consumers ever wants to be taken….. or especially taken for granted, the way Apple has done the Chinese People. When Apple’s arrogance and ignorance of the Chinese people was made so profoundly clear as when thy not only took advantage of their workers, but then tried to burn Proview by only paying a pittance for the iPad Name, that was Trademarked a decade earlier! That was the turning point in combination with SAMSUNG going in and treating them like the humans they deserve to be treated like. By directly employing them in hated Non-Chinese Taiwanese Hon Hai, who also treats them the same way Apple does!!! Soon, Apple won’t be significant in China to even be counted since its Chinese smartphone market position keeps slipping. Apple is now fourth, behind Samsung, Lenovo and ZTE. Is a new market that is exploding…don’t be stupid and say they will have a small market share…as most grow is in android, but apple doesn’t compete with crap phones they only do the high end market and that market is not that big in china as many chinese will rather get cheap android phones, but soon they will feel their cheap phones is garbage and will decide to get something better that’s where apple may give them an option. Chinese want iPhones so bad they will sell a kidney for one…they are just cheap so won’t go running and spent 5 months of salary on one..but if they can get the money they will..